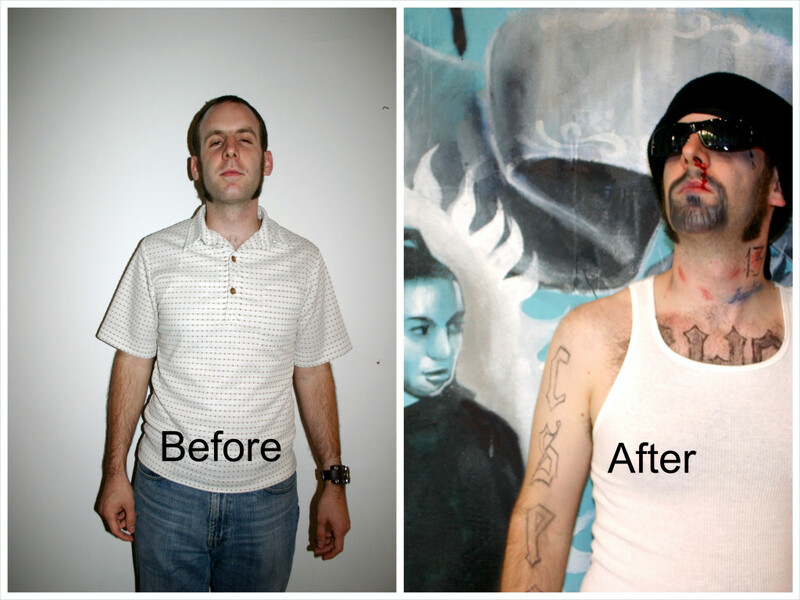 In 2005, Glamour Shots was part of a larger exhibit on gentrification. Gentrification is defined as the process of renewal and rebuilding accompanying the influx of middle-class or affluent people into deteriorating areas that often displaces poorer residents and artists. The entire exhibition was called The Store Front Project, curated by Adrian Rivas at Gallery 727, located in downtown LA. Adrian was inspired by the writings of Grant Kester, a Professor of Art History in the Visual Arts Department at UCSD. Each week Adrian’s store front gallery space would become a different business, mimicking the drastically changing downtown area of Los Angeles. The original concept of a Puerto Rican Pride photo studio business was that of photographer, Vanessa Sepulveda (aka Vanessa Shaushkin). Multi-disciplinary artist Raul Baltazar added the self-scripted and impromptu political performance aspect to the store as the store front security guard, greeter, club barker and host. Rigo Maldonado and I were agitated with the sudden American media approval of Gwen Stefani (lead singer of No Doubt) dressed like a Chola. A Chola is a Mexican/Chicano term used to refer to a teenage girl who is closely associated to a street gang and dresses in a unique (non-mainstream) style of make-up, hair, and clothing. The Chola style has been common in California barrios, since the 1930s. In California, teens dressed in a Chola/o fashion who are walking on a public street are photographed by the police and placed in a gang member file, even if they are not in a gang. Public schools punish teens who dress in this fashion. To witness a media campaign on Chola attire being acceptable, because a white woman is wearing it, is offending to decades of Latino teens in California (and Mexico) who have been persecuted for this style. Our attempts at engaging people passing by to agree to a free make-over failed, because they were uncomfortable wearing the gang style. Yet, people lingered with curiosity outside and across the street, to view the process through the store window. Fortunately, our community of artists loved playing the roles and getting their glamour shots, they also created some of the makeovers. Ms 40oz, Jennifer Salinas was an actual Miss America contestant from Chicago, who performed a gang style blessing for all the fallen hommies (gang members), with a pseudo ribbon-cutting ceremony for the the Glamour Shots storefront. My family owned businesses in San Diego where I grew up. The two elements that they always had was a mural and a grand opening—the latter with mariachis. I brought these ideas to Glamour Shots.